I love trying old-fashioned American desserts, and this apple slump recipe delights me with its quirky name and homey simplicity. A slump is simply baked fruit with a dumpling crust that “slumps” around the fruit as it cooks. Also known as a grunt or pandowdy, a slump is pure comfort food, especially when served hot with generous helpings of vanilla ice cream or heavy cream. 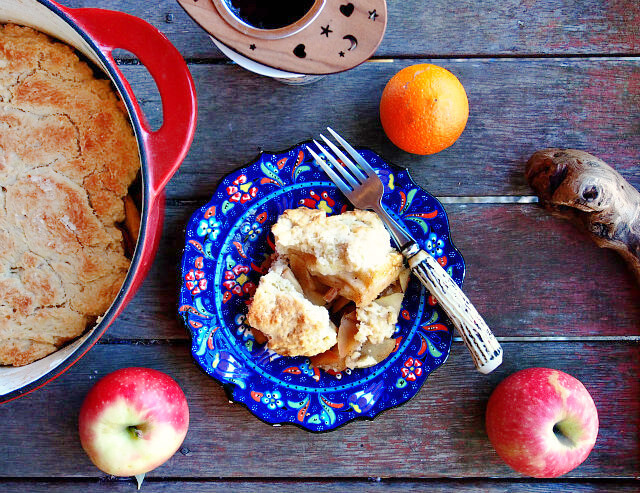 The first published apple slump recipe was in American Regional English in 1831. I always knew a slump as a grunt, so named for the noises it makes while baking, so I was charmed to discover they are the same thing. 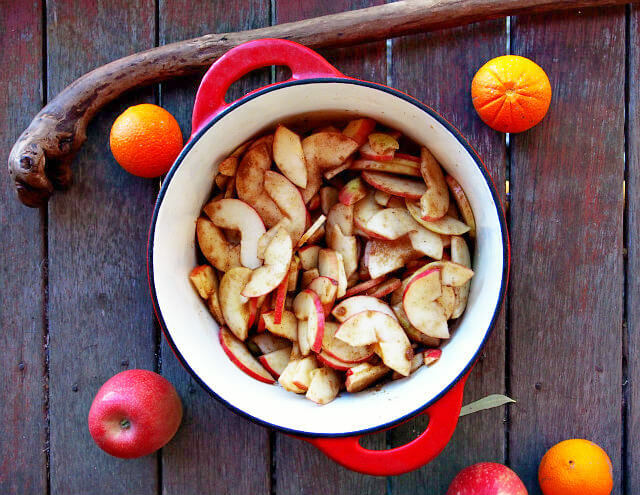 You can make a slump with any fruit you like, from peaches or blueberries to plums or strawberries, but an apple slump recipe is an inspired autumnal choice. Apples are lovely in so many desserts, from our Perfect Weekend Apple Cardamom Coffee Cake and Caramel Apple “Almost” Pie with Caramel Drizzle, to Apple Bread with Crumb Topping. Since apples go beautifully with so many different spices and flavorings, an apple slump recipe can be as plain or elaborate as you like. You can keep it simple with just a hint of nutmeg or drizzle of vanilla, or amp it up with real maple syrup as a sweetener and add a handful of roasted almonds, walnuts, or pecans to the batter. This time I made a cinnamon rum apple slump recipe, and it was wonderfully fragrant as it baked. When it was time to dig in, the scent of warm apples, cinnamon, and rum entranced the eater before they even took a bite. That’s my kind of dessert. 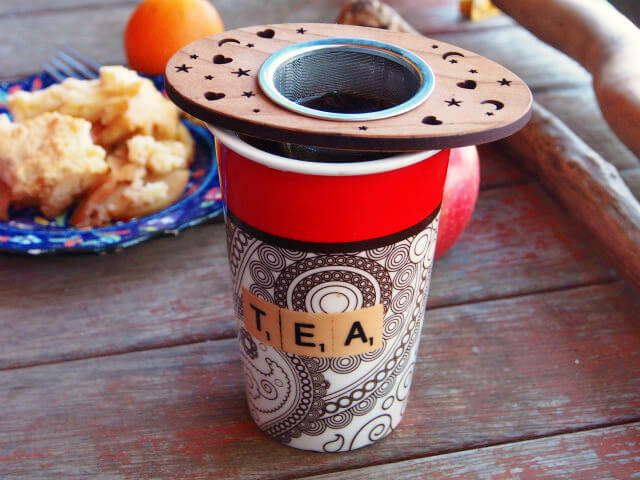 This apple slump recipe is nice paired with our Caramel Almond Black Tea with fresh apple pieces and cinnamon chips, Peaches n’ Cream Oolong Tea fragrant with vanilla and fresh peaches, or Comfort Blend Black Tea with orange and cinnamon. The best part of this recipe is that it’s not too sweet. So if you’re craving something special on a cold fall morning, this might be a fabulous breakfast option. The filling is best using a tart apple such as Pink Lady or Granny Smith. Most slump recipes call for peeling the apples, but I rather like the added texture the peels provide, so I leave them on. I add a generous sprinkle of cinnamon, another of cardamom, and a couple teaspoons of rum extract. I also add a drizzle of freshly squeezed orange juice, and it blends beautifully with the apples, spices, and rum. A traditional slump topping is akin to a dumpling and is usually plain, allowing the apple mixture to shine. I like to give it a little bit of love by mixing in a spoonful of orange zest. This adds a nice, fragrant depth of flavor without detracting from the fruit filling. I also like to press down a bit on the topping when I add it to the apple mixture so that it maintains contact with the syrupy goodness of the sauce and doesn’t dry out. 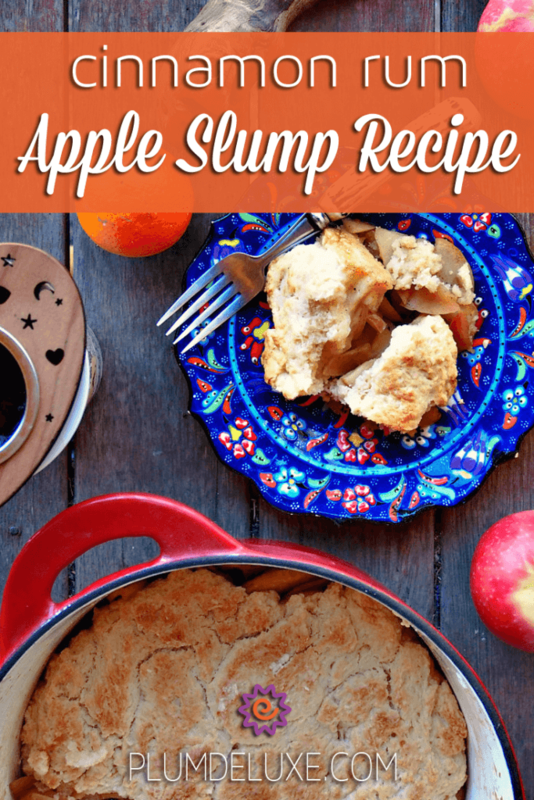 This apple slump recipe is great served hot straight out of the oven, warmed up the next day, or even cold. I like mine served with a generous drizzle of heavy whipping cream, while my hubby prefers his with two scoops of rum and raisin ice cream. It’s also nice with a tablespoon of melted butter poured over the top, or a spoonful of sweetened whipping cream. Preheat oven to 350. Grease 9-inch round cast iron baking dish. In large bowl, add all filling ingredients and stir gently until evenly coated. Pour evenly into baking dish and bake 20-25 minutes until fruit is soft. While apples are baking, stir together dry ingredients for batter. In small bowl, whisk together egg, orange zest, milk, and butter, then add to dry ingredients and stir gently until dough forms. 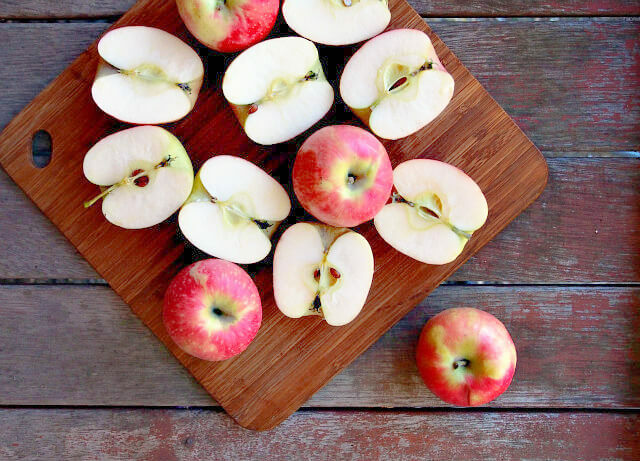 When apples are baked, add batter by spoonful, pressing gently so it nestles around the apple slices. Bake about 25 minutes or until top is golden and toothpick inserted into the middle comes out clean. Serve warm with ice cream or heavy cream.